The 15th Annual Atlanta Tattoo Festival gets rolling at Crowne Plaza Hotel Atlanta-Perimeter Northeast. The three-day event presented by Sacred Heart Tattoo attracts thousands to see world-class artists, live tattooing, seminars, contest, unique vendors, a bikini contest on Saturday at 6 PM, and live music by Six Shot Revival, Killer and the Savage with Cool Breeze from the Dungeon Family, Kadense, and more. Hey, hey, it’s The Monkees‘ 45th Anniversary Tour at Classic Chastain. 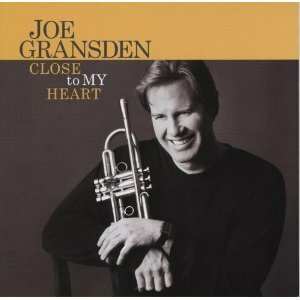 Joe Gransden and his 16-piece big band team up with blues chanteuse Francine Reed at Eddie’s Attic. Atlanta Botanical Garden launches its Concerts in the Garden summer series with blues guitarist extraordinaire Jonny Lang. Callanwolde’s Jazz on the Lawn 2011 summer outdoor series begins with high-powered jazz by Nick Longo. Electromatics merge Chicago/West Coast Blues, Blue Eyed Soul and an essence of Standard Jazz and Sinatra at Fernbank Museum of Natural History’s Martinis and IMAX. 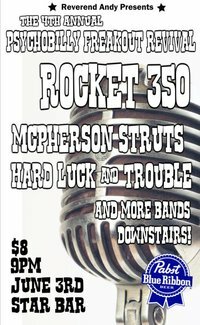 The Official Monster Bash Pre-Party rocks the Star Bar. 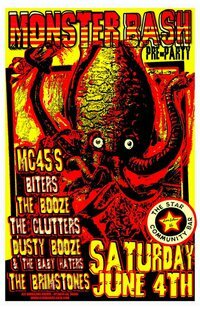 Get revved up for a horrorific Sunday at the Starlight Six Drive-In with bands MC45’s (The Forty-Fives all MC5 set), Biters, Booze, The Clutters, The Brimstones from New Jersey and Dusty Booze & the Baby Haters. Gates open at 10 am at Starlight Six Drive-In for the 2011 Rock ‘n’ Roll Monster Bash. The all-day party is a Retro horror fan’s righteous nightmare with live music, vendors and movies. Bands this year are Super X-13, Brimstones, LUST, Radio Cult and Spooky Partridge. At dusk, the reels roll with GODZILLA 2000, RINGU and crazed J-horror classic HOUSE. Check out a scary sneak preview from Kool Kat of the Week and Horror Host with the Most Professor Morte himself Shane Morton here. Nathan Nelson & His Entertainment Crackers headline blues “dunch” between 1 and 4 PM at The Earl.